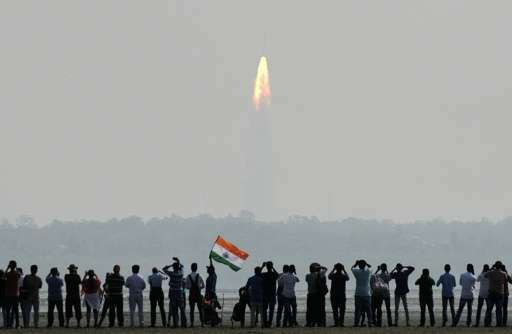 India successfully put a record 104 satellites from a single rocket into orbit on Wednesday in the latest triumph for its famously frugal space programme. 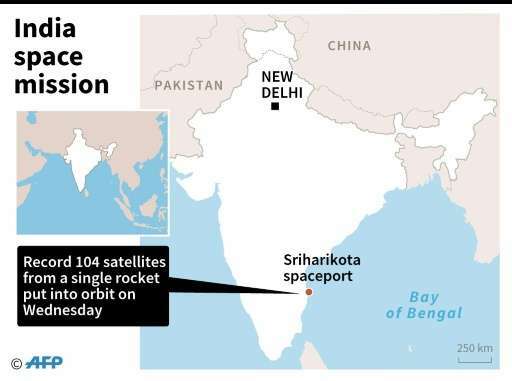 Celebrations erupted among scientists at the southern spaceport of Sriharikota as the head of India's Space Research Organisation (ISRO) announced all the satellites had been ejected as planned. "My hearty congratulations to the ISRO team for this success," the agency's director Kiran Kumar told those gathered in an observatory to track the progress of the Polar Satellite Launch Vehicle (PSLV). Prime Minister Narendra Modi congratulated the scientists for achieving the feat which smashes a record previously held by Russia. 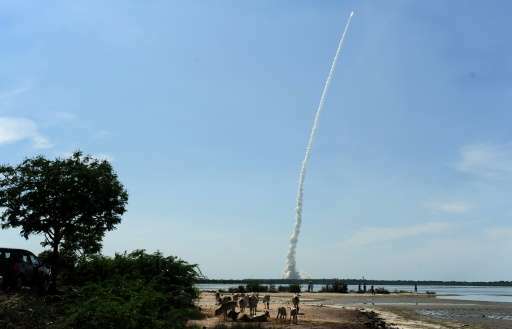 The rocket took off at 9:28am (0358 GMT) and cruised at a speed of 27,000 kilometres (16,777 miles) per hour, ejecting all the 104 satellites into orbit in around 30 minutes, according to ISRO. The rocket's main cargo was a 714 kilogram (1,574 pounds) satellite for Earth observation but it was also loaded with 103 smaller "nano satellites", weighing a combined 664 kilograms. The smallest weighed only 1.1 kilogram. Nearly all of the nano satellites are from other countries, including Israel, Kazakhstan, Switzerland and 96 from the United States. Eighty-eight of them are from Planet Inc - a San Francisco-based Earth imagery company - and weigh 4.5 kilogram each. Only three satellites belonged to India. Scientists sat transfixed as they watched the progress of the rocket on monitors until the last payload was ejected, and then began punching the air in triumph and hugging each other. This was PSLV's 39th successful mission, known as India's space workhorse. And it is another feather in the cap for ISRO which sent an unmanned rocket to orbit Mars in 2013 at a cost of just $73 million, compared with NASA's Maven Mars mission which had a $671 million price tag. India has carved out a reputation as a reliable low-cost option, relying in part on its famed skill of "jugaad"—creating a cheap alternative solution. Experts say much of its credibility stems from India's successful launch of the Mars orbiter, which gave it an edge over its rivals in the space race. "India is proving to be a very viable option because of the cost and the reliability factor," said Ajay Lele, a senior fellow at the Delhi-based Institute for Defence Studies and Analyses. "India has been doing these launches successfully and has established itself as a very reliable player." Mathieu J Weiss, a liaison officer for France's CNES national space agency who is currently in India, said ISRO had pulled off a major feat. "It's a great technical challenge to launch so many satellites at once into orbit on the right trajectory so that they don't make contact with each other," he told AFP. Weiss said India had become a major player in the space race by making itself so competitive with its low costs and by working with private companies which are space specialists. "India has become a space power in its own right in recent years," he added. The 50-year-old space agency plans to send four more rockets into space later this year ahead of its second lunar mission Chandrayaan-2 slated for 2018. Modi has often hailed India's budget space technology, quipping in 2014 that a rocket that launched four foreign satellites into orbit had cost less to make than Hollywood film "Gravity".